Hi and Seasons' Greetings to all! This afternoon, friends Miltiades, DocVag and I, played a fiction SYW battle with Prussians vs French. I was enlightened about the scenario by St. Mace, Friday night in my sleep. Nice terrain setup, but we need the Orders of Battle! 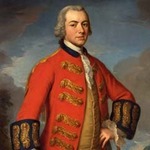 All French commanders, except Monsieur Le Dithereur of the Militia, are Dependable. French light guns can only be manhandled. All line infantry battalions and the grenadiers have regimental guns. The brook is passable with half move, artillery can pass only from the bridges. All woods are soft cover. Walls, trenches and the town are soft cover. The town can hold two battalions. For 15mm scale, we used a 6' by 4' table. The French Extreme Right Wing Brigade enters fleeing, chased by the oncoming Prussian stronger force. They stop one or two cavalry moves far from the edge of the table. From next round the French Dragoons may spend half move to dismount as standard light infantry. They may find cover behind the walled fields or the cemetery, a tree copse or retreat to the town. have eliminated more French units than they have lost. In all other situations the French win. I deliberately designed the French to be heavily handicapped. One French brigade could be added as reinforcement, entering the table on the 5th Round from the Cemetery road. It could have 2-3 standard Line Infantry battalions and 0-1 gun battery. Their task is to possibly retake the town, as the position of the French Grenadiers guarding it is very difficult. In 10 turns duration the victory conditions for both would be to hold the town. Yesterday I stumbled on a buffet. Your spirit, diluted in wine spirit is not always helping to write a decent report. Miltiades brought his well painted minis and Doc Vag (a notorious Prussophile ) took with great joy the Prussians. of the French Grenadiers guarding the town, precarious. towards the town as very risky. plus cannonade from the two Prussian Heavy Artillery batteries. Turn one and The Prussians, having the first move, brought their Jäger Brigade at the edge of the woods. The one rifled-armed Jäger battalion could harass my troops keeping safe long range (rifle) distance. I replied by moving a bit forward two of my 1st Line Infantry Bde battalions plus one (the leftmost) in skirmishing order. One more battalion and the Light artillery battery remained entrenched, holding the passage between the central hills. against my positions. Their Heavy guns started passing the bridge over the brook. hindering the Cavalry Brigade behind them to make a sensible move. But also my dithering militia hesitated to move, so next turn I brought the C-in-C near them for some encouragement. I moved my two cavalry regiments in behind my left flank infantry, threatening the Prussian skirmishers not to dare march closer. The Prussian grenadiers brought a double move, deployed, and their first battalion dared to attack the town totally unprepared. and went straight to the box much to Miltiades' dismay. sent back with four hits two battalions the front line of the 1st Prussian Infantry Bde. but being quite mauled by their receiving fire, one of my battalions retreating with 4 hits, the other having received 3. I brought my C-in-C near and deployed my cavalry in line, in case the Jägers dared to reappear. remained in three successive lines, not being a tactical threat for the moment. The two remaining Prussian Grenadier battalions deployed and started exchanging fire with my Grenadiers. The result was my Grenadiers to be forced to abandon the town with 4 hits leaving it next move to be occupied by the Prussians. In the center, the militia refused to help anybody in danger , at leat they managed to deploy in line. The 2nd Prussian Bde, attacking the hills, provoked my 2nd Bde to step down and attack (after bringing a 6). On the fourth round my Extreme Right flank 3 Dragoon regiments appeared chased by the superior Prussian Mixed Bde. squeezed against the riverside, so, with my center evaporated and the town lost, I admitted a heavy defeat. The Prussians lost 3 battalions and the French 4 battalions and a battery. It took only five round to see a concrete result. Unfortunately, they all belong at the opening stages of the game. "Not enough memory. Delete pictures? (Y/N)" On the "No" order, refused to take further than my 14th picture. We enjoyed the game much, in the Scenario post above, I proposed some amendments for a more balanced game. Happy New Year's Eve for all of us! Saint Mace is often found in close company with Saint Vino, at least in my experience. Both of great virtue! Seems that I'm not the only one they visit! Although I regret to not see any pictures of the real action, your report is very fine and the scenario interesting. Thanks for charing! After my camera failure, friend Miltiades was kindly asked to provide photo coverage, which he promptly did, I inspected some nice pictures of the later stages of the game in his i-phone. A Windows 10 fine update technique made my mailbox say that my account access (!?!) is not synchronized to this device (what? how it was perfectly working before the update?) and 36 hours now I'm left without being able to receive or send e-mail messages, so the pics are pending on their way to my mailbox. I hope I'll fix the problem the sooner possible and I'll have the pleasure to provide you with many more (and much more beautiful) pics! Fortunately, the rest of the Internet functions properly... Let's not be greedy Cheers! 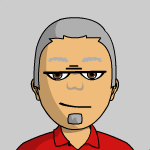 Mr Antoniadis (I hope that is correct), once again thank you for your generous contribution to the forum. I am well aware of the time and effort that is needed to prepare and then share such an excellent scenario. I hope to see more photos soon. I feel really honoured by your so kind words! It is your fine work in the form of a rulebook that inspires me to go forward! For all of us who love wargaming (I'm painting, modelling, wargaming, rule writing 40+ years), spending time and effort is a real joy when you have to share its fruits with good friends! Happy New Years' Eve to all of us and a healthy and prosperous New Year 2019! You are a brother in arms my friend! And I enjoy every game we play together! Dear friend Miltiades, thank you! He managed to upload after remote control, prayers, gnashing of teeth and groaning his photos of the later stage of the game at Flickr! Most of them are taken from Miltiades' side, so we can admire some Prussian close ups. Miltiades, I am really grateful, so that we can complete the battle report. Cheers! We can see the French Grenadiers taking four hits, the town emptied and then taken by the Prussians. Also, the French dragoon regiments that arrived at the 4th round chased by a superior Prussian cavalry force and then dismount. 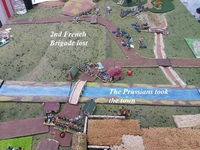 The other French Grenadiers who were at the same side of the river ran to cover their left side. In the center, also the Prussians have taken some punishment. But with a whole (3 unit) brigade done for and their left flank severely threatened, the French had no hope to regain the town, so the game ended as a convincing Prussian victory.